13 Jul Is The Fivefinger Lawsuit the End of Minimalist Running? I have been asked by many of our personal training clients here in Charlotte, NC if the recently settled lawsuit in regards to the Vibram Fivefinger Shoes is the beginning of the end for barefoot or running with minimalist shoes. First, we need to understand that minimalist running has always been only an option for a small group of runners. Although the fivefinger shoes were really successful for a while , they started fading out of the stores before the lawsuit was filed or even settled. This does not mean though that minimalist running, or even the fivefinger shoes are leaving the running scene. Quite the contrary I think what was a fad for a while has just claimed its rightful place as a fringe element of running again. Is Minimalist Running Good or Bad? That question is not so easily answered. The thought process behind minimalist running is that we were born without shoes and that the human feet have evolved to carry our load efficiently walking, jogging and hiking. Shoes are considered a hindrance to the natural biomechanical function of the foot. This thought deserves some merit. We are definitely born without Nike’s on our feet. 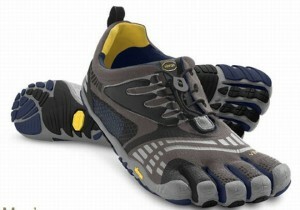 But before you go and jump into your fivefinger shoes or any other minimalist shoes hold on a second. The opponents of five finger shoes have pointed out rightfully before that we do not run or walk on the same surfaces anymore that our ancestors used to tread on. Instead of walking on packed mud and dirt we use sidewalks, asphalt and gravel. None of those surfaces are as soft as packed dirt. In addition, our feet have been, depending on our age, in shoes for decades. This is the equivalent of wearing a cast on your arm for said period of time and then expecting some high performance athletic maneuvers after taking them off. Definitely a recipe for disaster. So what is the conclusion? If your feet are healthy wearing no shoes or minimalist shoes like the fivefinger fibrams can possibly have a positive impact on your strength in your feet. Barefoot is always superior to any kind of shoe due to the stimulation of receptors in your feet. Depending on the structure of your feet either caused by genetic background or years of wearing shoes, heels, etc, toe shoes might not be good for you at all. It is not a one size fits all. For some of my personal training clients it has been a positive change, for others I do not recommend it. Going barefoot and stepping on stimulating surfaces like grass, mud is great. If you are trying to go more barefoot or wear toe shoes go slowly. 20-30 min here and there when walking in and around your house or when doing chores can get you started. If you consider running with toe shoes start with 100 yards and slowly increase the distance. Learn how to run properly with a midfoot strike. Don’t blame the shoes for bad form. Make sure that you learn how to run from an expert regardless of what kind of shoe you are wearing. Research indicates that the running cadence you have is more important than what shoe you wear. Try to stick around a cadence of 180 steps/min. I really like the shoes for my weight lifting days as well. They are the next best thing to being barefoot or socks and a gym usually does not complain. I just have a better “feel” when picking up heavy weight.